Having a floor with the beautiful look of real stone is affordable and easy to install with Innovations Tumbled Travertine Laminate Flooring. You'll get textures and a random pattern that captures the beauty of stone. This flooring comes with an attached underlayment to reduce noise under foot. Each tongue-and-groove is fully sealed to help prevent moisture penetration, and the patented Joint Guard technology protects joints from chipping. Innovations floors are also GREENGUARD Certified for Low-Emitting Products, providing an environmentally friendly solution for your flooring needs. 18.56 sq. ft. per case, case weight: 30.10 lbs. 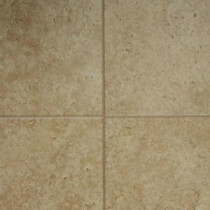 Buy online Innovations Tumbled Travertine 8 mm Thick x 11-3/5 in. Wide x 46-3/10 in. Length Click Lock Laminate Flooring (18.56 sq. ft. / case) 836245, leave review and share Your friends.